List of Girls for Coromandel scholarship(CGCES), Selected students for Grameena Pratibha Purashkara Progromme, Coromandel Girl Child Education Scheme (CGCES), Mana gromor rural girl child scholarship programme, Coromandel scholarship amount: One of the oldest and most successful programme - The Coromandel Girl Child Education Scheme (CGCES) was conceptualised with the aim of providing educational assistance to girls in class IX and X and encourages them to continue their education. It sets out to achieve equality of educational opportunities and promotes the development of talent in rural areas by educating talented rural girl children in government schools. This programme was based on our findings that more than boys, it is the girls who drop out of schools after completing class X. Boosting Girl Child’s Education Scheme Hence, the scholarship has been designed to encourage girls to continue their education. This scheme is also an impetus for parents to recognise the girl child's inclination and talent instead of simply getting her married after class X. The scholarships motivate parents to encourage the girl child to achieve greater heights for self-development. This initiative is successfully running across government schools in Gujarat, Tamil Nadu, Andhra Pradesh,Telangana and Jammu & Kashmir. The scholarship was instituted by the Coromandel International Limited. The scholarships, in the form of ATM cards in collaboration with State Bank of India, to be handed over to the girls at a programme organized at Ashoka Hotel Hanamkonda. The scheme was helping the girl students to continue their higher education. Coromandel International Limited, as part of their corporate social responsibility (CSR) give away scholarships to girls students. Meritorious students from all formats of government-run schools such as Zilla Parishad and Municipal Corporation schools, from classes IX and X, from about these schools both in the city and from rural areas were selected to receive the scholarships. The scholarship amounts were Rs. 5,000 for first rankers and Rs. 3,500 for second rankers and to be given away in this programme. Coromandel International, the fertiliser major, plans to bring smiles on the faces of young girls, with timely financial support, while continuing its efforts to supplement the efforts of hardworking farmers. 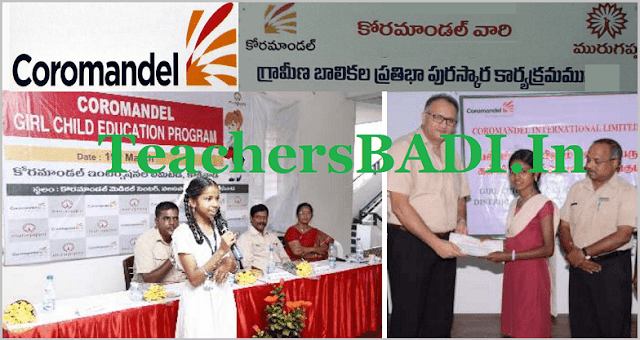 As many as selected girl students from the Warangal district of Telangana State will benefit financially from an initiative called ‘Mana gromor rural girl child scholarship programme' of Coromandel International Ltd, part of the Murugappa Group. The corporate house will reward the selected girl students on March 11at a function in Warangal town. The aim of this programme is to extend financial support to poor rural girl students to ensure reduction in number of rural girl school drop-outs and help them go for higher education.